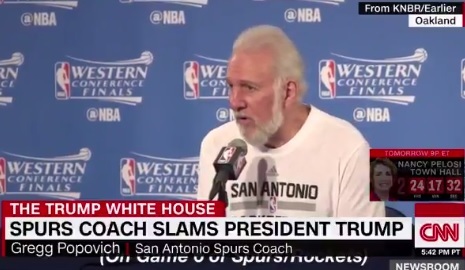 San Antonio Spurs coach Gregg Popovich went off on President Trump in a pre-game interview on Sunday. Because everyone wants to hear an NBA coach rant incoherently on politics before a playoff game. The Spurs refused to stay in Trump Hotels this year after Donald Trump won the presidency. CNN celebrated the coach’s drivel.